Registration is open from 30 March 2017 and will close on 17th April 2017. Once you have booked your test, all candidates are requested to check your email often. A total of 50 seats are available and will be offered on first come first basis. The Royal Institute of Management will be providing Free IELTS Tutorial Class for candidates registered for 29th April 2017 exam with the IELTS Centre at RIM. 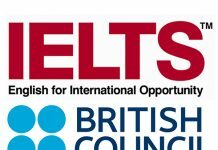 The IELTS Tutorial will begin from 17 to 26 April 2017 at the RIM campus from 5.00 PM to 7.00 PM (2 hours daily). 9am – 5pm during office hours only.